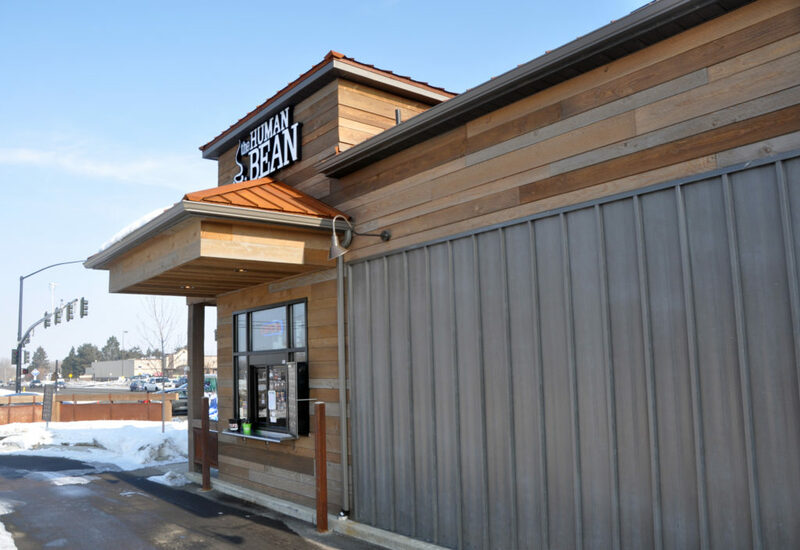 Incorporating both of Montana Timber Products ranchwood™ and AquaFir™ colors, the Human Bean coffee shop of Meridian, Idaho, results in a perfect eye catching rustic blend as fine as their coffee. Mix use of ranchwood™ and AquaFir™ produces an eye catching display. Our flagship product, ranchwood™ is Montana Timber Products’ chemical free, kiln dried, alternative milled rough stock wood. As an ideal reclaimed lumber alternative, the aesthetically pleasing rustic barn wood ranchwood™ is the result of an environmentally safe production process. Offering uncompromising natural, rustic beauty, ranchwood™ is typically less expensive than antique reclaimed barnwood. The inviting warming colors of Southern, Western, Shale, and Yellowstone of the siding and soffit beckon customers for a fine cup of coffee. Wire Brushed and Circle Sawn are Montana Timber Products typical texturizing options, but Montana Timber Products is a custom millwork shop that caters to our customer’s needs. Contrasting metal with rustic Circle Sawn ranchwood™ and AquaFir™ products produces a harmonious, inviting texture. If the environmentally friendly and the renewable aspect of natural wood siding is important to you, be sure to do your homework when choosing your siding, interior accents, trim, timbers, or other wood siding products. Some companies choose to use degenerative chemicals to achieve the desired look and texture of rustic wood siding. This is not the case with Montana Timber Products.